HOW ARE YOU FEELING TODAY, OFFICER? "I’m doing great. The weather’s beautiful, I’m feeling healthy, and crime is at a standstill right now so it’s a good day." WHY IS CRIME STANDING STILL? "Because I’m standing here." 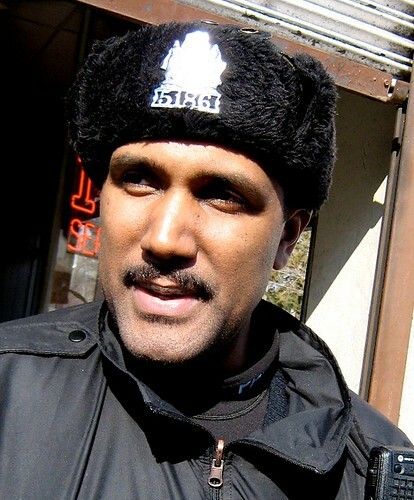 Philadelphia Police Officer Herman Willis, 14th District,Greene Street and Chelten Avenue. 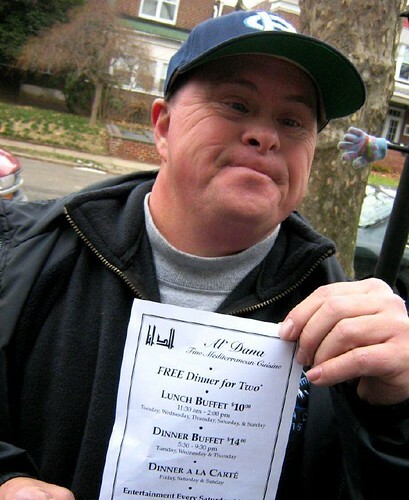 “I’m working for Al Dana and I am delivering these menus to every house and hope they’ll come over at ours to enjoy lunch or dinner.” Thomas Walsh, distributing menus for Al Dana. WHAT KIND OF RECYCLED PRODUCTS DO YOU SELL? “We have the recycled paper, the recycled pads. Some of the bubble mailers -the papers used are actually recycled paper. We have a recycle program. We recycle ink and toner cartridges… I SAW A FELLOW EMPTYING STUFF IN A DUMPSTER, LOOKED LIKE SOME PAPER THERE. IS IT POSSIBLE FOR YOU GUYS TO RECYCLE YOUR OWN PAPER? 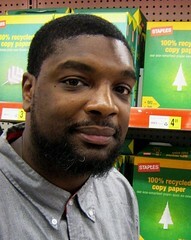 No, we don’t recycle here; we pretty much shred everything up most times and have someone pick up the shreddings.” Reginald Johnson, Staples Assistant Store Manager.